If I want to use my stainless steel portable sink inside and outside, will I have any problems? A stainless steel portable sink is a great option for both inside and outside use. 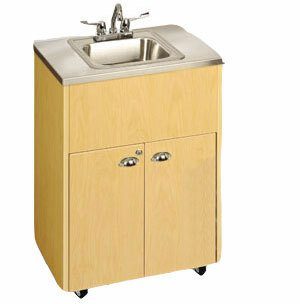 There are stainless steel portable sink models that are built just for outside use. The outdoor models have slightly different construction to help deal with the damage that can occur because of exposure to UV rays and to help prevent damage to traditional types of cabinets. These sinks have high density polyethylene for the cabinet doors and front with galvanized or stainless steel back and sides. The castors that make these units easy to move and reposition are also upgraded in the outdoor models to ensure they are durable and long lasting. The models also come with a sink cover that will help protect the entire sink and cabinet when not in use. Of course, you can use an inside model stainless steel portable sink for outdoor use, provided it is stored inside and out of the elements. This is a perfect option for use on a patio or deck where it is outside only when the family is enjoying the outdoor living space. This is also a good option for schools when outdoor events are happening or for trade shows, community events or outdoor activities. What are the different types of basins that are common with a stainless steel portable sink? There are multiple different options for basins depending on the specific size of the cabinet that you select. There is a standard basin design and a side sink design that can both be fully integrated with the countertop to provide a seamless top and basin component. These standard sinks typically measure 10 to 14 inches in width, approximately 11 inches in length and 6.5 inches in depth. Standard stainless sinks are slight larger at 12 inches in width, 10 in length and just under 6 inches in depth. Specialized sinks that are standard with many cabinet combinations include the deep sink, which will measure just less than 10 inches. Double and triple basin sinks are slightly smaller but provide different sink areas that utilize the same centrally mounted faucet. This is a great idea for busy portable sinks or for functions like outdoor or indoor catering services, trade shows or demonstrations. What are the different heights available with a stainless steel portable sink unit? The cabinet heights and dimensions vary based on the features offered and the customization required. Standard cabinet height range from approximately 34 inches up to approximately 38 inches. Other specialized cabinets such as those for classrooms and daycares are much smaller at about 28 inches in height. 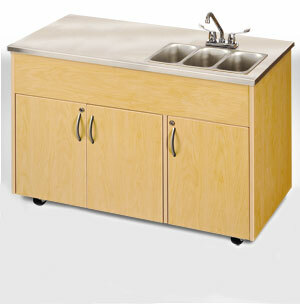 There is always the option to customize the height of your stainless steel portable sink cabinet. This is only possible if the company actually constructs the cabinets and sinks and also offers customers the option to design the sink that they need. Usually these custom designed sinks also allow you to configure storage space or add from a list of specialized features.